Thank you for purchasing a BlueRail Trains Bluetooth Smart model train control board. With this board you will have direct control over your train motor and up to 4 accessories using any Bluetooth Smart phone or tablet. Using Bluetooth smart you can control as many Bluetooth trains as you want simultaneously using any powered track system (22 volts or less DC/DCC) or battery. The software app in your smart device and in the board itself can be updated wirelessly. Combining this with the built-in expansion port, you can always look forward to added features and capabilities for years to come. 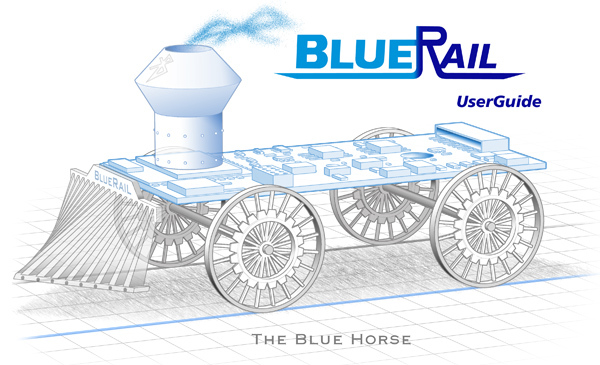 Our first BlueRail board, nicknamed the Blue Horse, has a slightly wide profile (in HO terms): 58mm x 28 mm x 5 mm. Although this board is well suited for an HO steam tender, it can be utilized any way you see fit, in any gauge train within spec. We will release a narrower board as well as a board supporting higher amperage in the near future. For an overview of installation considerations, please read this page about the Blue Horse. This page includes important information on space and electrical suitability considerations, as well as links to articles like Testing Motor Stall Current, Isolating Motor and Lights from Frame, and Battery Powered Trains. When connecting your BlueRail board to your locomotive, please refer to this article on Using 8-pin Connectors as well as the general wiring diagram on the Blue Horse page. Here is a summarized BlueRail Board Installation Guide document. BlueRail boards can be operated from any bluetooth smart enabled smart device (phone or tablet). This includes any Apple iOS device and Androids running Android version 4.3 and newer. 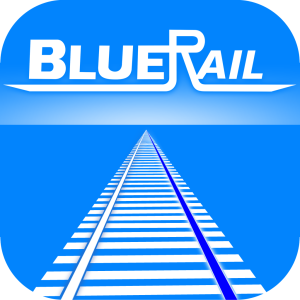 Please download the free BlueRail app from the Appstore or GooglePlay store. These boards can also be operated using the Bachmann E-Z App which will run the board using default settings. 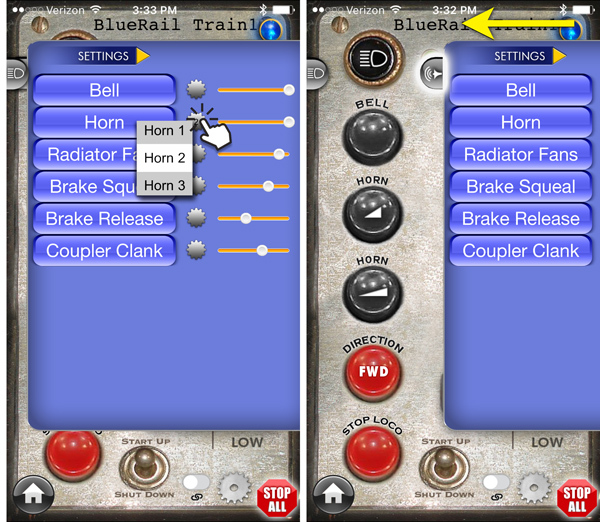 The BlueRail app will allow you to further configure the app for your particular control needs. 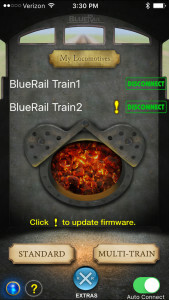 It is very important when using Android (or iOS) to run bluetooth trains that you update your device to the latest software available for your model. Please refer to THIS ARTICLE about how to update your device to the latest version of Android. The vast majority of Android devices that meet the minimum requirements and can download the free BlueRail app will support all aspects of BlueRail. However, due to the huge number of different Android models and manufacturing standards, issues may be encountered on some devices. Android 6 (Marshmallow) is compatible with BlueRail. However, due to changes in Bluetooth permissions with Android 6, the app may not be able to detect the BlueRail boards properly. To resolve this issue, go to Settings in the OS–> Location and turn on location services. Your BlueRail board will now be detected properly in the app. This may require a wi-fi or cellular connection on certain devices. CRASH REPORTS One of the most valuable tools in Android development is the built-in “Crash reports”. If you experience a “crash” while running the BlueRail Android (which rarely occurs), your are generally given two options: “Close” and “Report”. Please choose “Report” and add a sentence or two in the space provided to tell us what led up to the crash. This report is sent immediately to us and gives us valuable insight on what caused the crash, and allow us to fix the problem in the next app update. One of the principles of BlueRail is that your train control shouldn’t require a hefty user manual. It should be intuitive and easy to customize/operate without a lot of explanation. We strive to achieve that in our interface. When a train or board is powered up and in range, it should appear in the home screen of the application with the option to “connect” or “disconnect” from any train. Once you have “connected” to a train it is no longer visible to other users (or other applications) until you choose to “disconnect” from a train. For more detail about this please refer to our article on “Understanding and Troubleshooting Bluetooth Connections”. From the home screen you can run your trains using the Standard train control screen, or using the Multi-Train screen (if you need to see multiple train controls onscreen at the same time. The home screen also gives you access to firmware updates when available (see information about firmware updates below). Trains are principally controlled from the train control screen which is reached by touching the name of a connected train or pressing the “Standard” button on the home screen. This screen gives you throttle, sound, and light control for your train. If you have more than one train to operate simultaneously, left/right arrows will allow you to switch to the next train. 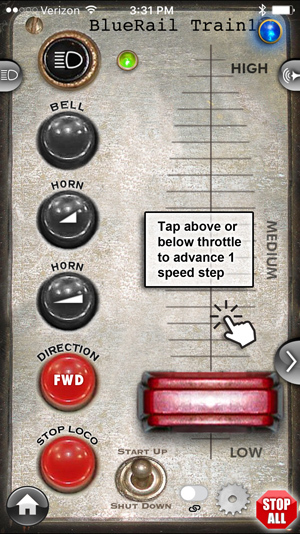 You can achieve more refined speed control by using the “tap above/below throttle” feature. Simply tap your thumb anywhere in the area above the throttle to move up one step. Tap below the throttle to come down by one speed step. This is nice to use when your train first takes off or comes to a stop. It also makes it easier to operate your train without having to look at your smart device – the clickable area is easy to find without looking at the interface. You can control your locomotive’s slowest speed step from within the “settings” (picture of a “cog”). The default starts your train on speed step 2. If your train is capable of slower speeds, you can lower that to speed step 1. In the upper left corner of the train control screen is a small button/tab that gives you access to the Extended Light panel. This allows you to configure and operate up to 4 lights (or accessories). You can pull the panel out half way (to simply operate lights) or all the way (to configure lights). You can name each light or accessory from this screen and adjust it’s settings, with options for standard on/off, flashing, ditch lights or use as a momentary switch (to trigger accessories). You can also set any of the ACCs to “inactive” if you do not plan to use them. The “Directional Lighting” toggle at the bottom allows you to turn on directional lighting (head light on when going forward, rear light on when traveling in reverse). We will add more special lighting fx (strobe,mars,firebox etc) in a firmware update. This board may also be used on your layout to control 4 lights, trigger servos, turnouts, sound-boards or accessories. Here is a link to a video demonstrating use of the Extended Light Panel. Here is a link to a video demonstrating use of Ditch Lights. In the upper right corner of the train control screen is a small button/tab that gives you access to the Extended Sound panel. This allows you to configure and operate sounds. You can pull the panel out half way (to simply play sounds) or all the way (to configure sounds). You can customize the bell and horn/whistle for your train by clicking the cog button directly to the right of the horn or bell button. There are presently 3 options for each bell/horn to choose from. The volume of the sound can be controlled with the orange volume slider. As we add additional sounds and options, they will become available in this area. 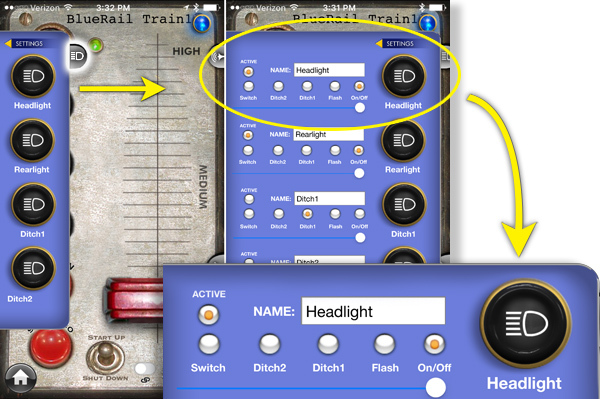 If you are controlling more than one train, the “Multi-Train” button will become available on the home screen (in iOS). This brings you to a screen that allows you to control multiple trains simultaneously on a single screen. You can arrow left/right when running more than 3 trains. Multi-Train is not currently in the Android control app. You can accomplish all the same train control functions from the standard control interface (and toggle between multiple locos). To quickly toggle between locos in standard train control view, look for the little black arrow button at the left or right of the train control screen. Additional locomotive settings for each board or loco can be configured from within the “Settings” screen which is accessed by clicking the “cog” in the train control screen. These settings help control smooth slow speed operation. 1st Speed Step (1,2,3) Set first speed step for “tap above” throttle. Direction Swap Switches forward and reverse. Advanced Tuning Turns on advanced tuning panel in train control screen. We regularly update the software control app with new features and sounds. If you have your device set to “Update Automatically” this will happen automatically. Otherwise use the App Store or GooglePlay from your device to receive the latest update. Because of the App Store approval process, 7 days is the fastest turn around on iOS updates. Please refer to THIS ARTICLE on how to update your device to the latest software. From time to time we will release “firmware” updates through the app. Firmware is the software in the bluetooth board itself. The ability to easily update firmware is arguably this product’s greatest strength. This allows us to grow the protocol as needed. Your internet connection must be on to receive firmware updates. The update is very safe, and will not damage your board or train. If for any reason the process fails, the train maintains a copy of its old firmware. Simply repeat the update. Please contact at Support AT (our website) for technical help with your BlueRail product. We have many Articles in our Article Page to answer many popular questions.